Toronto’s Bridal Show & Last Bride Standing have joined forces for a 3-day event of tantrums, tiaras and bridal meltdowns. Okay, I don’t know that for sure. But there is a 3-day event. And I’m quite certain that there will be tiaras. The tantrums and meltdowns will be at the discretion of the attendees. But a Bridal Show is a Bridal Show. And if you’ve got planning to do (or you just like the general atmosphere of weddings and all the accompanying trimmings), I say get yourself to the Toronto Congress Centre. Plus, if you’re into reality shows this is definitely the spot for you to let your tenacious Bride-to-Be colours fly! 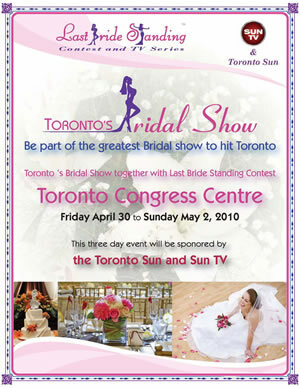 The contest itself gets underway April 27 in Woodbridge, Ontario and runs until… well, the Last Bride is Standing. First prize is valued at almost $70,000, so if you don’t mind looking like a crazy freak show (and even if you don’t in real life, you’ll be playing one on TV after editing gets through with you) then sign yourself up! Vera Wang + David’s Bridal = le swoon! It goes without saying that Vera Wang knows what she’s doing when she slaps together a frock. With wedding gowns that can fetch up to $13,000, though, this isn’t likely to be what the more frugal bride is sporting as she waltzes down the aisle. But take heed all you brides-to-be with Champagne tastes and Wine Cooler budgets! It was announced two days ago that a partnership between Wang and David’s Bridal would be launching a new bridal collection with gowns priced under $1,500. That’s a pretty remarkable price tag for something by Ms. Wang. And, though we don’t have any David’s Bridal locations up here in Canada (by the way, David’s Bridal – what’s up with that?) word has it that the line will be rolled out to the Great White North by the end of 2011.